You hear scratching, rustling, and clawing in your walls, ceilings, vents, attic, and basement. You notice damage to your furniture, furnishings, electrical wires, and the features of your home. You find trails of droppings and spots of urine throughout the interior of your home. 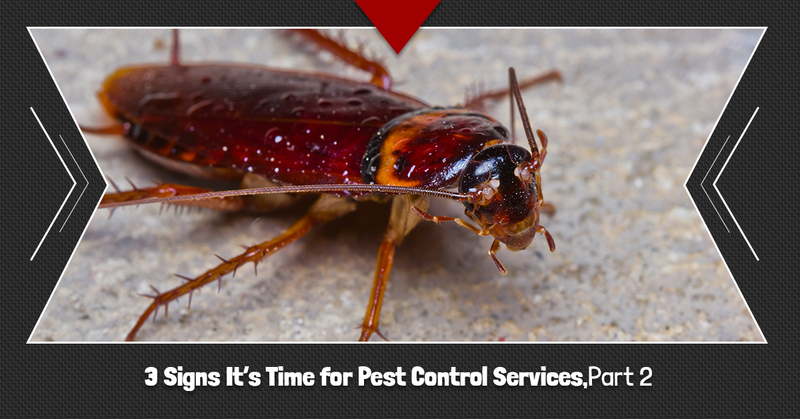 Today, let’s look at three more signs telling you that you may have a pest problem, which should be handled by the pest removal experts. If you notice these telltale signs, then give Critter Wranglers a call for Top Rated Local® pest control in Knoxville. We’ll get rid of your pest infestation once and for all. If you spot cast shells or casings of bugs who have entered into a new life stage, this could be a sign that you have a pest infestation. Molting is typical among insect species that shed their exoskeletons when they grow such as bed bugs, carpet beetles, cicadas, earwigs, and cockroaches. If you find cast shells indoors, this may be the sign of a pest problem. Another sign similar to that of molting is when you start finding increasing numbers of dead bugs inside your home. While it’s normal to find bug carcasses around the exterior of your home and outside of windows, frames, and panels, it’s when you begin finding them inside that there could be a larger issue. If you notice more than two dead bugs of the same species inside your home, call a pest control professional right away to schedule an inspection. The sooner you take care of the problem, the better. Pests make their nests inside and outside of homes using everything from organic yard waste and shreds of paper to wood shavings and cardboard scraps. Rodents typically nest in dark, damp areas such as attics and crawl spaces, as do some species of insects such as ants, wasps, bees, and other flying pests. If you spot a nest anywhere in or around your home, it could be a sign of a larger problem, so you’ll want to call Critter Wranglers immediately. If you actually see the insects or rodents in your home, even if you only spot one, this could be a sign that there are more pests hiding within the walls, ceilings, and dark voids of your home. Oftentimes, it’s when pests are identified but not taken care of that a small problem quickly turns into something much worse. It’s best to contact the experts for pest control services. If you notice any of these signs, your best option is to contact our friendly and experienced team of rodent and pest removal experts. We can safely eliminate your pest problem and return your home to a much safer, more comfortable state for you, your family, and your pets. Plus, we guarantee to use the most humane pest removal and pest control methods possible. Call the experts at Critter Wranglers to request a quote for pest control in Knoxville, and let us get rid of your pest problem for good.